Oh no, it's a witch! Run for your lives! Call a priest! Burn her at the stake! We've got to- Hang on a second, guys. Look at this witch. This isn't some evil, scary witch. Why, look at her! She's so cute! She doesn't look like she could hurt a fly. And that adorable little pointed hat! It's priceless. Somebody get a picture. 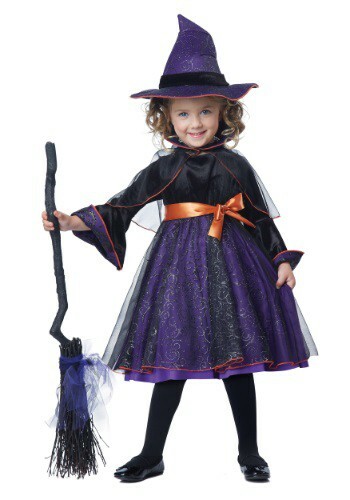 Go ahead, little girl, hop on that broomstick of yours. For centuries, we've thought that witches were up to no good, casting spells, cursing people, having terrifying cackling laughs. But you're not like that at all. In fact, maybe we've been wrong about witches all along. Maybe they're not so bad, just trying to get by any way they can, just like the rest of us. We can't believe how horrible we've treated some of your kind. Now that we know the error of our ways, let's go get ice cream! Has the above situation ever happened to you? No, right? You're still terrified of witches and all of the magic they possess. But what if there was a way to change the hearts and minds of the people? What if one little girl, one witch, could help people open their eyes and see that we can't judge people just from whether or not they cast spells, or if they fly on broomsticks instead of driving cars. We've got to look past all that. That's where your little girl comes in. If she's wearing this outfit, she's not just being a witch for the day, she's changing the world. No one could stay mad at that adorable face. They'd be too busy under her spell (pun intended but obviously as a responsible witch she wouldn't use her spell powers for evil). Change how people view witches. Help them to accept these girls. And to top it off, your little girl will be absolutely thrilled to try her hand at casting spells and flying that broomstick. Beautiful!! !just the way it looks on the pic!